Emden, a seaport city (1950 population, 36,762; 51,692 in 2006; coordinates: 53° 22′ 20″ N, 7° 12′ 24″ E) of Lower Saxony, Germany, on the Dutch border, largest city of East Friesland, the seat of a Mennonite congregation ever since early Reformation times. In the summer of 1530 Melchior Hoffman came to the city and united the Sacramentist elements that had been fleeing to Emden from the Netherlands. He must also have had some following among the Reformed clergy of the city, for he baptized about 300 persons in the Geerkammer (vestibule) of the Grosse Kirche. This bold deed attracted a great deal of attention. The authorities of the city and the province, both civic and clerical, prepared for energetic resistance. Hofmann left the city and went to Strasbourg (z. Linden, 256). Before he left he installed Jan Volkerts Trypmaker to take his place. Trypmaker continued the work in the city and also sent out missioners. Two weeks before Christmas 1530 he baptized the martyr Sicke Freerks (Vos, 24), but soon had to leave the city because of increasingly severe measures against the Anabaptists. Exactly a year later he was martyred at Amsterdam. But the brotherhood in Emden continued. On 12 May 1534, Count Enno wrote a letter to the Emden authorities, urging a close watch on the Anabaptists, and ordering that they be arrested wherever found. Also Enno’s stern mandates of 1535 and 1537 prove the presence of Anabaptists. Especially Dirk Philips must have worked here with considerable success. At Enno’s death in 1540 their number was greater than before. His widow, Countess Anna, gave them protection and toleration. Menno Simons took advantage of this toleration to make a brief visit to Emden. During 1536-42 he spent some time in the nearby village of Oldersum. Johann a Lasco, the reformer of Emden, invited him to a debate, which was held with Anna’s consent in the church of the Franciscan monastery in Emden, 28-31 January 1544, before a large audience. Present were also the Reformed clergymen Gellius Faber and Hermann Brassius. The debate dealt with the Incarnation, infant baptism, original sin, sanctification, and the true calling of preachers. Both sides claimed the victory. A regrettable literary feud developed between Menno and a Lasco. Menno soon had to leave the city. At the insistence of Charles V, Anna passed a mandate ordering all the adherents of a sect, especially the Anabaptists, to leave the city and province at once. A Lasco succeeded in having it limited to the Davidjorists . Nevertheless Menno left and went to Cologne. His followers, the quiet Anabaptists, were unmolested. To be sure, to comply with the emperor’s demand, the countess issued another severe edict on 6 April 1549, but it was not vigorously applied. In 1547 a momentous meeting of the Anabaptist leaders was held in Emden. Menno Simons, Dirk Philips, Frans de Kuiper, Adam Pastor, Hendrik van Vreden, Antonius of Cologne, and Gillis van Aken debated the important doctrines of the Incarnation, infant baptism, and avoidance in marriage. Frans de Kuiper and Adam Pastor sharply opposed Menno and his friends, and finally left the brotherhood. Once more, in 1549, Menno was in the city to discuss matters with his opponents (Vos, 91, note 4). Two years later, in 1551, Menno ordained Leenaert Bouwens as elder in Emden. Bouwens lived in ‘t Falder, a neighboring village. In 1551-54 he baptized 51 persons in Emden (City) and in 1556-82 another 360. Through his extreme severity on the question of the ban, he brought great trouble upon the brotherhood. When Zwaantje Rutgers, a pious woman of Emden (Vos, 132) of blameless conduct, did not want to give up companionship with her husband, who had been placed in the ban, Bouwens banned her. The others disagreed with this procedure. Letter after letter of complaint reached Menno; he wrote a conciliatory letter to Emden, urging peace. The three-day colloquy to which the Reformed challenged the Mennonites in 1556 was held in Norden (Blaupot t. C., Friesland, 120). It dealt chiefly with the Incarnation. In a letter of 8 April 1562, the Mennonite congregation at Dokkum requested Emden to assist them in obtaining a preacher. The request was presumably granted. In 1567 Dirk Philips came from Danzig to Emden. Here he wrote a reply to Hoyte Renix and four letters to Jan Willems and Lubbert Gerritsz, the elders at Hoorn, summoning them to Emden to talk with them. When they did not comply, he commanded them in the fifth letter to “stand still” in their office until it could be determined whether they were guilty or innocent. In the same vein he wrote to the Hoorn congregation. When the congregation replied that they would not let their elder go to Emden, but that he should come to Hoorn, he sent a sixth letter to Jan Willems and Lubbert Gerritsz, demanding more positively than before that they lay down their office, threatening to put them out of the brotherhood if they refused to come. Hoyte Renix had obeyed the demand, but in return demanded that Dirk Philips come to Bolsward to prove his charges. When this did not happen, his congregation exonerated him, and he felt justified in resuming his office. Then four representatives of the churches in North Holland and five from Friesland came to Emden to settle the dispute. After being urged six times, Dirk Philips agreed to come to a border city in Holland to deal with his opponents and bring the matter to a decision. Meanwhile a meeting of the preachers in North Holland had been held, from which Jan Willems, Lubbert Gerritsz, Pieter Willems, and Bogaert and Hoyte Renix were sent to Emden. They met with the nine brethren on their return to Holland in Appingedam and decided to go to Emden together, in order to clear the matter there. But Dirk Philips did not wish to deal “with the crowd” and ordered only Jan Willems and Lubbert Gerritsz to come to him; they did not comply, whereupon Dirk Philips put them and their friends in the ban on 10 July 1567. This led to a division in the Emden congregation into a Flemish and a Frisian group. The two parties at first opposed each other radically. There was absolutely no communion between them. The most sacred ties of family were broken by strife. Anyone who wished to join the other party had to be re-baptized. All attempts to unify them failed. On 2 April and 22 May 1578, a mutual offer of peace was made (Doopsgezinde Bijdragen 1893, 81), but it failed. The elder of the Flemish congregation at Emden about 1569 was Jan van Ophoorn. He was austere and implacable, and is reported to have banned the entire congregation except himself and his wife (BRN VII, 69 f.). On 17 January 1568, a meeting of Waterlander preachers was held at Emden, at which 21 points were agreed upon. It was the first meeting of this kind in this branch of the brotherhood. Points 1-7 deal with the elders and their work in the churches, 8-15 with preachers and deacons, and 16-20 with the bearing of arms, working for the churches, and marriage outside the brotherhood, and point 21 was an appendix on the regulation against lending money on interest (Doopsgezinde Bijdragen 67-75). External pressure was added to internal strife. On 9 January 1577, the mayor and the city council wrote a complaint to Edzard II, saying that the Mennonites were doing a thriving business in the city, and that they were holding their meetings openly (Müller, 29). Edzard replied that all such preaching and meetings should be strictly forbidden. In February 1578 he wrote that Menso Alting had informed him that about 1,000 Anabaptists were coming from Holland, and that they should not be permitted to settle in Emden. This warning was also occasioned by the large number of Mennonites from the outside gathered for the disputation of Emden from 25 February to 17 May 1578 between the Reformed and the Mennonites. The leaders of the Flemish, Frisian, and Waterlander Mennonites from the Netherlands and Friesland were there. In 124 sessions they discussed 14 points of doctrine. It was peaceful in character, but did not lead to any practical results. An extensive report of the debate was published at Emden in 1579 with the title Protocol. Dat is, Alle handelinge des Gesprecks tot Embden. In the next year, 3 April 1579, seven representatives and preachers of the congregations at Rijp, Purmerend, Amsterdam, and Rotterdam gathered in Emden; a consequence of this meeting was the union of the Emden congregation with the Waterlander wing of North Holland (Doopsgezinde Bijdragen 1877, 79; Blaupot t. C., Groningen I, 264-70). Under the influence of Hans de Ries an agreement was drawn up which breathes the spirit of true Christian generosity and brotherly love (Brons, 121). The assumption that Hans de Ries was the elder at Emden at that time is probably an error. He was there only temporarily, and did not serve as elder of the Em-den congregation until 1592-98. The church had experienced a great influx of Waterlander Dutch refugees, and de Ries gave it valuable assistance in making the adjustment (Doopsgezinde Bijdragen 1863, 115). Further growth of the congregation at Emden was prevented by severe repressive measures on the part of the government; the center of the Mennonites in East Friesland was shifted to Norden. Count Enno III (1599-1625) issued an edict on 21 November 1612, prohibiting the Mennonites from exercising their religion in the open, and a mandate of 20 November 1630, set a fine of 5,000 talers on any Mennonite worship services. For eight years the Mennonites remained quiet. Many may have left the city in the meantime. As usual, the prohibition ended in extortion. For a payment of 12,000 talers on 22 August 1622, Enno granted the 400 Mennonites living in his realm the right of private worship services for a promised period of ten years. When this sum was not paid he issued a new edict on 25 September depriving the Mennonites of all rights and protection. His successor, Rudolph Christian 1625-28, finally gave the Mennonites a letter of protection, which became the basis for all future terms (Mitteilungen der Gemeinde Norden, 1914, 150 f.). But this was not the end of oppression. Again and again these rights were violated, until an additional payment was made. Rudolph Christian’s successor, Ulrich II 1628-48, revoked all liberties granted the Mennonites on 10 March 1641. After further extortion they were restored by Enno Ludwig, 1651-60, in May 1658; but in 1666 Christine Charlotte, regent for the minor Christian Eberhard, forbade Mennonite worship. On 18 September 1666, the Mennonites were summoned to give an account of their teaching, and two days later a fine of 30 gold guilders was set for Mennonite religious services. After lengthy negotiations the Old Flemish group received the desired letter of protection for the sum of 400 talers on 7 December 1666, and the Waterlander group on 2 April 1667. The Old Flemish or Uckowallists (they were often called Mennonites, whereas the Waterlander group had since 1579 adopted the name Doopsgezinde) were a branch of Mennonites named after Ucko Walles, who came to East Friesland from Groningen in 1637, from where he had been expelled, and is said to have lived in a village between Emden and Norden. He returned to Holland, was expelled again, and rented the land of the former monastery of Sielmönken in East Friesland until shortly before his death. He was the strictest of all the Mennonites, adhering to foot-washing and a severe interpretation of the ban. A register of Mennonites in Emden and vicinity (Emderland) in 1644 shows 12 families belonging to this group. For a long time they met "outside the old New Gate," in the house (Wilhelmstrasse 11) now known as the "Uckenvermaning." Members of this Uckowallist congregation or Groningen Old Flemish congregation lived in Emden, Emderland, and Norden . This congregation in 1710 had a total of 65 men (the number of women is not given). In that year a friendly division took place, and henceforth there were two congregations—one at Norden, and one of Emden and Emderland. The Emden-Emderland congregation had 65 members in 1733, 70 in 1746, 44 in 1754, and in 1767 Emden had only 7 (Emderland apparently became independent between these dates). In 1739 the Uckowallist congregation acquired a new church. The preachers then were Myndert Waerma, Lourens Warners (from 1721), Pieter Popkes (from 1731). They were followed by Hendrik Waerma 1741-60. By 1767 it had been without a preacher for several years. On March 9 of that year it merged with the Waterlander congregation, sometimes also called the United Flemish and Waterlander congregation, or even United Frisian and Waterlander congregation. It is not clear whether the entire Flemish congregation adopted the strict convictions of Ucko Walles, or whether a part of this congregation acted independently and then later, perhaps soon after 1665, united with the Waterlander-Frisian congregation. A strange division occurred on 22 October 1692, in the Waterlander congregation. Jehring relates the following account: A preacher, Mindelt van der Stork, moved from Groningen to Emden "for business reasons." In preaching he had a silent prayer before the sermon and an audible one at its close. Soon he offered both of the prayers audibly. When the preacher in charge grew weak, van der Stork was requested to take his place for a small compensation, on condition that he offer the opening prayer silently again. He did not consent and the church council yielded the point. All this had taken place without the knowledge of the congregation, "which alone had the right to negotiate in such affairs." A meeting was held after the church service to ask the preacher why he had done this. He explained the situation and persisted in his view. The consequence was a split. The dissenters were called the “silent ones.” The division lasted 40 years. In 1732 the group that had sided with the preacher joined the “silent” wing, sold its church, and gave all of its capital to the “silent” branch, which met "in the warehouse." For 37 years more the congregation continued to meet here. Then they purchased a house on Hofstrasse and remodeled it into a church. The total cost amounted to 6,174 guilders, which the members obligated themselves and their children to pay according to a rate depending on income. In 1776 the church was free of debt. The new church was used for the first time on 26 January 1770. On 25 December 1717, a flood devastated Emden, filling the church chamber with four feet of water. All the church records, which had been kept since 1582, were soaked and had to be replaced. In 1739 the Mennonites were required to present to the government a record of births and marriages. Both groups entered their marriages on the same register. In 1744 Prussia took possession of East Friesland. The Emden congregation was released from all special fees (the exact date is unknown) and no longer needed a letter of protection; it could now develop undisturbed. Its membership, however, remained small, declining no doubt through emigration. But at the same time its members were faithful and united, as is shown, for instance, by the numerous bequests and gifts made to the brotherhood. For a long time church discipline was exercised earnestly and carefully. Thus on 19 January 1643, the ministers of the congregation summoned a married couple to the church rooms and notified them that their conduct had created some offense in the congregation and that they had not kept their marriage vows. Thereupon they shook hands and promised to live as was fitting. Then the ministers prayed with them, asking that God might preserve them in evangelical discipline. On 24 January 1772, a chorister (Vorsänger) was excommunicated for some misdemeanors and had to give up his apartment in the church buildings. The Emden Waterlander congregation joined the Zonist Sociëteit in 1674 as soon as it was organized. All of the Emden ministers belonged to it; until most recent times they had all come from Holland. Some of them had studied in the Lamist Seminary and to some extent represented the more liberal point of view of this brotherhood. In 1702 Kornelius van Huyzen was confirmed in the ministry, and on 28 July 1709, he delivered a sermon in Altona on John 17:3, which resulted in his noted book, Historische Verhandeling van de opkomst en voortgang, mitgaders de Godgeleerdheijd der Doopsgezinde Christenen (Emden, 1712). In 1739 Cornelius van Campen became the preacher of the congregation. He was followed by Sjoerds Sijtses Hoekstra, who delivered his initial sermon on 17 November 1757. For 30 years, until his death on 17 August 1789, he faithfully performed the duties of the ministry. Under his leadership a new translation of the Psalms was introduced as a hymnal. On 10 October 1771, he began to conduct Thursday evening meetings from November to February, for an increase of 25 guilders in his annual salary. These meetings were discontinued after 13 years because of lack of interest. From April to September, beginning in 1784, the regular Sunday services were held in the forenoon, and in winter in the afternoon. The duty of the chorister (Vorsänger) was defined thus: the first song was to be Psalm 37:1; then Psalms 1, 25, and 116 were to be sung; Romans 16 was then to be read. Relations with the Reformed Church were friendly. For the celebration of peace observed by the Reformed Church in 1779 the Emden Mennonite congregation made a considerable contribution. After Hoekstra’s death the Emden pulpit was vacant for three years. Four deacons, Tobias Bouman, Pieter Onne Brouwer, Jan Tobias van Oterendorp, and Ysaak Bouman, took care of the congregation during this time. A list of voluntary annual contributions begun at this time showed the amount of 356 florins. Then a contract for a preacher was drawn up (the contract is found in Mennonitisches Lexikon, I, page 568 f., footnotes). Of six proposed candidates, Wynald Ewertzoon, the preacher at Blokzijl, was chosen on 25 December 1790; he refused the position even after a second offer with an increase of 1,000 florins in salary. The position was rejected also by the following preachers: Jansen of Campen, Hoekstra of Utrecht, and Rahusen of Altona. In 1792 Jan de Bleijker, a ministerial candidate of Utrecht, was chosen; he accepted, and on 24 June 1792, in the presence of the magistrate and numerous visitors from the city, he was inducted into his office by Hoekstra of Utrecht. But the hope of the Emden church now to have a capable preacher for an extended time was not to be realized, for in May of the following year de Bleijker was called to Helder and left Emden in spite of an offer of 100 additional florins and the omission of winter evening sermons. His place was filled by Konrad Bavink, the minister of the Groningen congregation, who was installed by Pieter Beets in May 1795. In 1808, after eleven years of faithful service, he accepted a call to Nijmegen. Again the congregation was left for some years without a minister. Again a series of preachers refused the call to Emden: M. Martens of Holwerd, who preached for a while, ministerial candidate Plantinus, A. R. Vink of Winterswijk, Jan van Hulst of Norden, J. Goverts of Rijsdijk, J. van Hulst of Cleve. The congregation was in need of a competent minister, especially since the Reformed Church had some good ministers who attracted members of the Emden Mennonite Church. Finally, in March 1811, the congregation acquired a preacher—Hendrik van Someren Greve, who served for 15 years, until his death in 1826. The congregation grew slowly. Whereas it had 74 souls in 1808, it had increased to 86 by 1814 (23 men, 18 women, 24 young men, and 21 young women). In 1834 the membership was 51. In 1860 it was 62, with a total of 106 souls. The levies for the support of the poor were high. The congregation spent almost 700 florins for members in need of support, and so for this reason it very definitely rejected the suggestion to assume the obligation to furnish money to young men of military age to pay for substitutes (28 May 1816). Equally definite was the position of the congregation on the question of the oath in a statement handed to the magistrate of the city of Emden on 6 January 1822, which says, "The church council, after taking the voice of the congregation on this matter and finding it in agreement with its own, considers the swearing of any oath in conflict with its principles, and therefore unpermissible and this on the basis of the requirements of Jesus Christ as found in Matthew 5:36-37, and James 5:12, at the same time supporting its position with the doctrine of various church fathers and honorable men after the time of Christ and on the general regard with which this opinion has been recognized by all governments here as well as in other countries through all ages. It must also be added that the upright, earnest declaration of the truth or promise of conscientious faithfulness, with the words 'Yea' and 'Nay'—the arbitrary misuse of which we consider equally punishable with perjury and thereby offer the state adequate security—is considered as completely satisfactory for the decision of important debated questions, as well as in the assumption of public office here (at least under French and Dutch authorities) as well as in neighboring Holland." "(1) We have no special educational institutions as have the other congregations of the city which draw contributions from the city treasury for their support and the pay of the schoolteachers. "(2) Even though our congregation is not so large with respect to the number of persons as the Reformed and the Lutheran Church of the city, nevertheless, certain members of our congregation can make substantial contributions to the city taxes. A number of us have quite extensive communications as merchants. A number own important city real estate. These are conditions which are too well known here to require any extensive presentation so that we relatively pay just as much to the city expenses as other churches. "(3) The endowment fund of our congregation is very small. The truly small salary of our minister of annually 700 Dutch florins, cannot even be met from the revenue of our endowment. The church members must make considerable contribution from their private funds for this purpose and in addition make further private contributions for the upkeep of the church building and to cover the support of impoverished church members." The magistrate replied on 27 November that he "could neither grant this petition himself nor recommend it to a higher office, since the constitution of the city of Emden in paragraphs 5, 27, 55, 57, and 58 by no means grants the Mennonite congregation equal rights with the three principal Christian confessions." In the reply of 4 December the congregation insisted on its right and referred to a royal rescript of 27 July 1822, which expressly stated: "It shall be permitted to well-qualified members of the East Frisian Mennonite congregations to enter into public office to the extent that they can be admitted to administrative positions of the city (if they upon entering this service submit themselves to those regulations which the A.G.O. wishes to have observed with respect to the performance of oaths in affairs of private law), and that members of the Mennonite brotherhood shall in the future participate in the rights granted to all citizens of the principal creeds, with respect to their appearing in the meetings of the citizens and in active voting." The church council of this congregation had obviously, with all the openness and the decisiveness with which it presented its position to the magistrate, already adapted itself to the circumstances of the established church. The council made a demand for support by the state equal to that which the ministers of the state church drew, whereas, as a matter of principle, the Mennonite brotherhood rejected all state aid. The same is evident in further negotiations with the magistrate of the city and with the government of the country. "1. That we have no creedal books like other religious parties, but only have the Bible as our regulam fidei (rule of faith). "2. That on the whole we differ from other Protestants only on two points of doctrine; namely, with respect to baptism and with respect to the oath. "To be sure, the idea that Christ had forbidden war service was formerly accepted and vigorously defended by all the Mennonites, and this may still be the case with some few individuals. In general, meanwhile, a thorough exegesis and free investigation has long since convinced the Mennonites that this their former position is by no means tenable. Our brethren in Holland have already for several decades and we in the last years clearly enough shown that we have given up this opinion and no longer differ from other Protestants therein." In this writing the principle of nonresistance was abandoned and the principle of brotherhood was not stressed. In January 1832 a lengthy document composed by a jurist (Brückner) was sent to the government with the petition "that paragraph 30 of the constitution of the state be authentically declared to mean that we as members of the Evangelical Anabaptist brotherhood in East Friesland enjoy absolutely equal civic and political rights with the members of the Protestant and Catholic churches." When the answer was long in coming they sought further legal counsel, and on 2 March 1848, they decided to send delegates, together with Norden and Leer, to Aurich to present this case. All in vain. In 1857 Consul Bernhard Brons was chosen as the delegate of the town of Emden to the second chamber, but he was rejected by the government because the Mennonites were not one of the recognized churches. It was agreed at a conference in Emden, that for the time being they would take no further steps of this sort until they had more favorable prospects with the government. In 1863 a deputation was sent to the king, who was staying on the island of Norderney for his health. It was apparently successful. Soon afterward, on 18 September 1863, the Norden congregation received upon its request of 10 August of that year the very important government decision that it should be counted among those churches which had been explicitly accepted by the state (details in Mennonitisches Lexikon, I, 570f.). The matter was, however, settled only on paper. When a member of the Mennonite congregation of Norden was elected to participate in the extraordinary session of the provincial states in November 1863 and admission was refused him as a Mennonite, the representatives of the three East Frisian Mennonite congregations met in Emden on 15 April 1864, and decided to present a petition to the assembly of the estates at Hanover; this was sent on 25 April. The petition requested that the new constitution about to be drawn up should make a clear statement that members of the Mennonite churches were admitted to complete political equality with the other recognized Christian churches in the country. This petition was not successful. It was finally the government of Prussia that granted the Frisian Mennonites full civic equality. In 1866 East Friesland, which was under Dutch dominion 1807-10, and French 1810-13, again became a part of Prussia. On 7 September 1900, the decisions of the Hanover government were set aside by the governor at Aurich, and the Mennonites were urged to secure the right of incorporation according to the Prussian law of 12 June 1874, relating to the Mennonites. This they did on 23 October 1901. But civic equality did not give the Mennonites religious equality. When their preacher, Dr. J. P. Müller, in a dispute with the magistrate of the city insisted on his right as a clergyman, it was pointed out to him that as a Mennonite preacher he was not one of the clergy in the intention of the regulation of 23 September 1867, and that the Mennonites could not claim complete equality with the Lutheran, Reformed, and United churches. Higher instances confirmed this decision. It was not until the great revolution of 1918 and the new German constitution of 11 August 1919, that the Mennonites of Germany received full religious equality, with the rights of a public religious society. Another law, unsought to be sure, secured to the Mennonites of East Friesland their membership in the Prussian state. When East Friesland was from 17 November 1813, to 15 December 1815, in Prussian hands, the Emden congregation in co-operation with Leer and Norden (without informing Norden of this step) asked for release from military service, obligating themselves not only to pay the customary protection fee, but also to show themselves grateful in other ways financially. Already on 17 December 1815, Frederick William decreed that the East Prussian Mennonites, like other Prussian Mennonites, be released from military duty. The total sum of 46,060 talers was set, of which the Emden congregation was to pay 14,950 talers. In response to a petition the total sum was, however, reduced to 15,000 talers. But the East Frisian Mennonites were not to enjoy this release from military service for very long. Even before the end of 1815 they became citizens of Hanover. They made a special appeal for consideration and finally achieved an offer of release from military duties if they would pay the sum of 100 talers for each member of the congregation that was subject to military duty, whether he was rich or poor (15 July 1817). The Emden congregation refused this offer, whereas Norden collected a sum for the purpose. On 23 May 1821, the special position of the Mennonites on the matter of military service was legally removed and henceforth they were treated like any other citizens. Then when East Friesland became Prussian again this question once more became acute. It was agreed at a meeting in Emden on 17 October 1867, not to present a special petition to the government and to make no use of any exceptional status. In the execution of the written and oral negotiations Deacon Ysaak Brons was outstandingly active. From 6 January 1832 to 22 September 1875, in addition to his business, political, and charitable activities, he managed his office in the congregation with unusual faithfulness, circumspection, and vigor, giving five pastors a most understanding support. Laurens van Hulst served the congregation for 23 years, 1827-50. He provided for the use of an organ, the introduction of a new songbook, for the repair of the church, the new pews, which were now rented out for the first time (1834), founded a branch of the Dutch Society for the Common Welfare, and founded a nature study association, which still exists. In recognition of his services the congregation raised his salary from 800 to 1,200 Dutch guilders and in the last years gave him an honorary sum annually of 100 talers. In 1850 he resigned to become one of the directors of the Teyler Association at Haarlem. With great sorrow they saw him leave the congregation. Next L. E. Hallbertsma of Ternaard was chosen as preacher; he was initiated on 10 November 1850, by Leendertz, the pastor of Leer. On 26 October 1854, he died. His widow was granted a pension of 200 talers. The Algemeene Doopsgezinde Societeit of Holland gave the congregation a considerable contribution. The next minister was L. T. Goteling Vinnis of Stadskanaal. After a trial sermon he was unanimously chosen on 27 May 1855. The congregation offered him an annual salary of 1,500 florins. He succeeded in stirring up and preserving an active spiritual life in the congregation. With the Dutch congregations he maintained active connections. Repeatedly the Emden congregation had the opportunity of aiding younger or even older Dutch congregations in building churches or parsonages. Also with the preachers of the congregations in Norden and Leer he maintained close connections and instigated a regular exchange of ministers with them. He required young baptismal candidates to make a written confession of faith to the church council. In the benevolent institutions of the city of Emden the congregation participated in an outstanding degree, as for instance in building a hospital or establishing an educational board. Vinnis also provided for the purchase of a new parsonage and for equipping the church with gas lights. Upon the request of several church members that he occasionally preach in German he held the first German sermon on 1 January 1860. The congregational endowment was considerably increased by the substantial sum of the “Boumannsfonds.” On account of unpleasant domestic circumstances Vinnis had to resign, and on 3 October 1869, he preached a moving farewell sermon on Rom. 3:28. His successor was S. Cramer, the minister of Zijldijk, Tjeenk Willink of Tjalleberd having rejected the offered position. On 25 September 1870, Cramer was initiated by Leendertz of Leer, but already on 15 August 1874, he accepted a call to Enschede in Holland. Then J. P. Müller, preacher of Zwartsluis, was chosen. He was also introduced into his office by Leendertz and held his initial sermon on 17 November 1874. Soon the wish became predominant that the preaching be done in German for the most part. The record book was carried on in Dutch until 1889, likewise the baptismal instruction. By 1889 the German language was the only one in use. Also a German hymnal was introduced. A plan to adopt a songbook of their own in common with the other East Frisian Mennonite congregations was not accepted on account of the cost; but on 1 October 1876, the Emden congregation adopted the Gesangbuch für die Reformierten Gemeinden Ostfrieslands. The women of the Emden congregation (women have voted in the church since 1826) presented a petition for the establishment of an endowment for the education of ministers in the German language. It will probably not be an error to assume that Antje Brons was the instigator of this move. She revealed a deep interest in the Mennonite brotherhood in Germany and it may be ascribed to her and to her oldest son, Bernhard Brons, who served as deacon of the congregation from 22 September 1875, to his death 8 June 1911, that the Emden congregation supported all the spiritual and communal efforts of the German Mennonites most warmly. Thus she participated in the founding of the Vereinigung der Mennoniten-Gemeinden im Westen Deutschlands (which had only the one meeting at Friedelsheim in 1874), the Mennonite Central Relief Treasury in the Palatinate, and above all, the Vereinigung der Mennoniten-Gemeinden im Deutschen Reich at Berlin in 1886. The Emden congregation also promoted actively the rising research in Mennonite history. Mrs. Brons in 1884 published the first history of the Mennonites in the German language (Ursprung, Entwicklung, und Schicksale der . . . Mennoniten); Pastor Müller published the results of his research in the state archives of Aurich in his book, Die Mennoniten in Ostfriesland vom 16. bis zum 18. Jahrhundert. His congregation supported him substantially in this undertaking. Also the publication of the Mannhardt Jahrbuch in 1888 and the research of C. A. Cornelius, Nippold, and Ludwig Keller, as well as the Comeniusgesellschaft founded by Keller were received with great interest. A congregational library was established. On 18 October 1898, when Müller resigned on account of advanced age, J. G. Appeldoorn of Gorredijk was chosen as his successor. He served for 18 years, and then accepted a call as professor at the Mennonite Seminary at Amsterdam. In 1918 A. Fast, a German-Russian, was chosen pastor, who has continued to the present, 1956. In 1921 the congregation had a membership of 80 and 10 children. World War I and its consequences struck a severe blow at the outward existence of the Emden congregation. The income from former endowments was wiped out in the inflation of 1923, as was also the capital of many members. As a result of losses on the field of battle and especially because of emigration of many younger members in search of better opportunities to make a living, the membership dropped sharply to 30 adults and 4 children. But there was enough spiritual strength left to give the impulse for a new growth, by means of two important decisions of the church council at the instigation of the new pastor in 1918. First, the three congregations of East Friesland, Emden, Leer, and Norden, as well as the small Gronau congregation, formed an experimental union. All four of these congregations had hitherto been served by Dutch ministers, all of whom retired because of age during these years. In 1941 the union was strengthened by three agreements: one between Emden and Leer, stipulating that the church capital of Leer be transferred to Emden in case the Leer membership should decline below a certain point. Second, a similar agreement was drawn up between Emden and Norden. 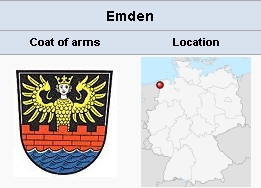 Since the capital of Emden had already been assigned to the Vereinigung, that of the other two congregations is now also assigned to it. Third, an agreement was drawn up between all four congregations to support the common pastor on a specified ratio. This was, of course, an emergency measure, which reduced the number of regular services and also the amount of time available for baptismal instruction. But these drawbacks were more than compensated for in the increased participation in all church functions. The second decision was, after consultation with other congregations, the removal of the restriction practiced in all European Mennonite churches with the exception of Holland, limiting the membership to old Mennonite families. This custom, originating in the earlier lack of legal status, which of course contradicted the principle of baptism upon confession of faith, and which promoted a clannish spirit, was to be dropped. The result of this decision was that more and more children of other creeds came to the instruction classes and were received by baptism into the Mennonite congregation. In 1925, 70 families, in most cases the parents of the children, requested admission. Also the congregations of Gronau, Norden, and Leer received members from other confessions. In Emden the membership including children rose to 200 in 1933, and in 1934 was able to enlarge the church and improve the residences of the pastor and the sexton. The "Mennonitentag," when the world conference met at Amsterdam in 1936, held a service at Emden. The congregation was in a thriving condition. Plans were being made to employ a second pastor for the Northwest German churches. Then came World War II, with its 80 per cent destruction of Emden. The church, the parsonage, and all the homes and businesses of the members were annihilated. The Mennonite library, with its very valuable Bibles and hymnbooks of former centuries, and also the archives with 39 large record books bound in pigskin burned at Sögel, where they had been put for safe keeping. In the following severe years of hunger, the completely impoverished members received food and clothing through the relief work of the American and Canadian Mennonites (Mennonite Central Committee). The Dutch Mennonites also contributed relief goods. Services were held in a barracks in the cemetery. But this was not yet the end of this, the oldest Mennonite congregation, in which Menno Simons himself worked. Since it was not feasible to build a church in the ruined city, it was decided to build a congregational house with a chapel and a residence for the pastor on the second floor. One half of the required sum was furnished by the four participating congregations, one third by American and Canadian congregations, and the rest as a loan from a bank. On 13 September 1953, the house was dedicated. The membership in 1954 was 218 baptized members. The pastor was still Abraham Fast. Brons, Antje. Ursprung, Entwickelung und Schicksale der Taufgesinnten oder Mennoniten, in kurzen Zügen übersichtlich dargestellt von Frauenbund. 2. Aufl. Norden: Diedr. Soltau, 1891. Available in full electronic text at: https://books.google.ca/books?id=BzU_AAAAYAAJ&printsec=frontcover&source=gbs_ge_summary_r&cad=0#v=onepage&q&f=false. Cornelius, C. A., Der Anteil Ostfrieslands an der Reformation bis zum Jahre 1535. Münster, 1852. Doopsgezinde Bijdragen (1861): 176 f.; (1877): 79; (1879): 7, 78; (1893): 13, 15, 59, 89 f., 81; (1898): 61 f.
ten Doornkaat-Koolman, Jan. Kurze Mitteilungen aus der Geschichte der Mennoniten-Gemeinden in allgemeinen und der Norder Gemeinde im besonderen bis zum Jahre 1797. Norden, 1903.
ten Doornkaat-Koolman, Jan. Mitteilungen aus der Geschichte der Mennoniten-Gemeinde Norden im 19. Jahrhundert. Norden, 1904. Fast, Abraham. Die Kulturleistungen der Mennoniten in Ostfriesland und Münsterland. N.p., 1947. Hege, Christian and Christian Neff. Mennonitisches Lexikon, 4 vols. Frankfurt & Weierhof: Hege; Karlsruhe: Schneider, 1913-1967: v. I, 565-73. Hoop Scheffer, Jacob Gijsbert de. Inventaris der Archiefstukken berustende bij de Vereenigde Doopsgezinde Gemeente to Amsterdam, 2 vols. Amsterdam: Uitgegeven en ten geschenke aangeboden door den Kerkeraad dier Gemeente, 1883-1884: I, Nos. 249, 254, 260, 465, 474, 484, 487 f., 490, 540, 594, 597; II, Nos. 2689-99; II, 2, No. 681. Jehring, J. C. Gründliche Historia. Jena, 1720.
zur Linden, F. O. Melchior Hofmann. Haarlem, 1883. Müller, J. P. Die Mennoniten in Ostfriesland vom 16. bis zum 18. Jahrhundert. Emden, 1887. Neff, Christian and Abraham Fast. "Emden (Niedersachsen, Germany)." Global Anabaptist Mennonite Encyclopedia Online. 1956. Web. 25 Apr 2019. http://gameo.org/index.php?title=Emden_(Niedersachsen,_Germany)&oldid=161260. Neff, Christian and Abraham Fast. (1956). Emden (Niedersachsen, Germany). Global Anabaptist Mennonite Encyclopedia Online. Retrieved 25 April 2019, from http://gameo.org/index.php?title=Emden_(Niedersachsen,_Germany)&oldid=161260. Adapted by permission of Herald Press, Harrisonburg, Virginia, from Mennonite Encyclopedia, Vol. 2, pp. 194-201. All rights reserved. This page was last modified on 28 July 2018, at 18:50.